Have you completed your USEF SafeSport Training? 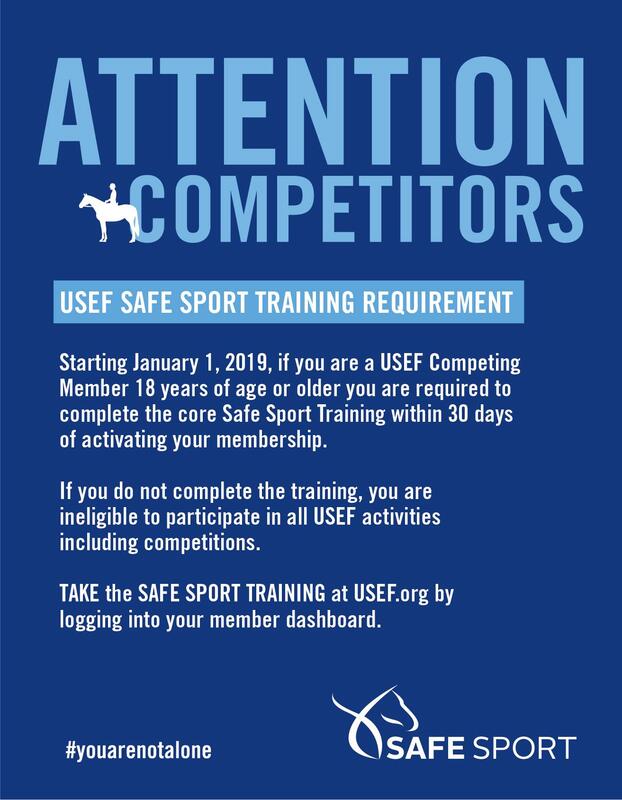 All USEF Competing Members 18 years of age or older are required to complete all three modules of the Safe Sport Training by January 1, 2019. On August 27, 2018, the US Equestrian Board of Directors approved a rule change requiring that, effective January 1, 2019, all US Equestrian (USEF) adult members with a Competing Membership must complete USEF's SafeSport training in order to be eligible to participate in USEF activities. Members can immediately access the free SafeSport training directly through their member dashboard or can click here to learn more. US Equestrian encourages members to complete the training as soon as possible. For technical assistance with completely the SafeSport training, please contact the U.S. Center for SafeSport’s Technical Support Help Desk at 720.676.6417. For additional questions related to SafeSport, please contact Teresa Roper at troper@usef.org.